BOMBAY, INDIA - Math instructor Vivek Astunkar barely caps his pen before 12-year-old Janhavi Shah calls out "one, three, two, one, six, double zero!" She has, in mere seconds, correctly answered Astunkar's whiteboard challenge - multiply 1,120 by 1,180. Unlike Dustin Hoffman in the film "Rain Man," Janhavi cannot instantly count toothpicks dropped to the floor. In fact, her nine classmates - all normal, middle-class Indian youngsters - confirm her results just seconds later. They've used a shortcut from Vedic math, an alternative approach to calculation that Indian ascetics may have devised more than 3,500 years ago. These yogic math techniques are mental exercises that can waylay the fear of numbers, build confidence and enhance creativity, says Astunkar. 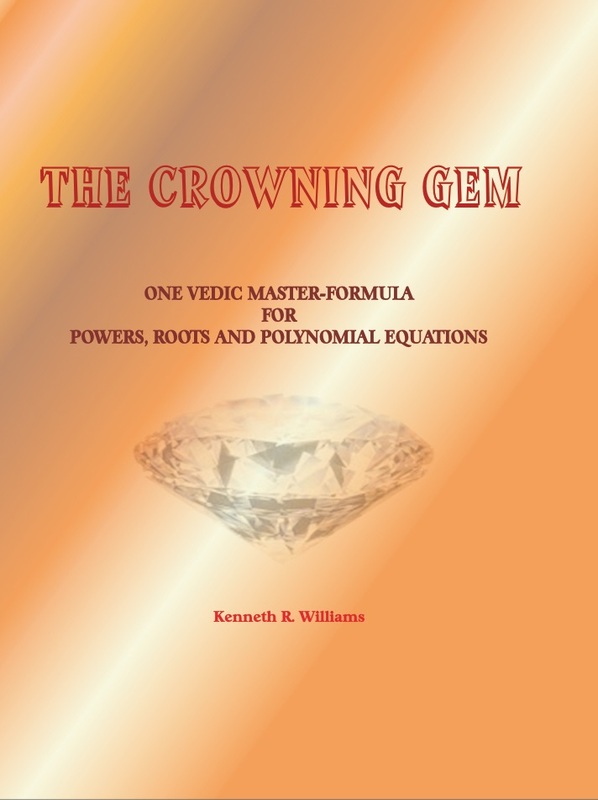 Vedic math is largely unknown in India, let alone the West. But that's changing. A local newspaper recently counted more than 40 Bombay schools using it. Astunkar, alone, has tutored thousands of students, and also supplies newspapers with weekly Vedic problems. And a few organizations such as Mathvedics, which has franchises in California and Colorado, are pioneering the approach in America. "School is just studies. This is fun," says Janhavi, who sits at the end of a couch, sandwiched by peers, in Astunkar's small apartment, four floors up in one of New Bombay's mid-rise buildings. It's Sunday morning and the students are happy, even giggling, as they speed through multiplication problems that would make the average adult sweat. Astunkar, an aeronautical engineer who left his software firm five years ago to teach Vedic math, excels at making it fun. Using a small whiteboard, he writes out problems for the kids to race through, afterwards explaining the Vedic techniques in a flash of scribbling. He says the methods, derived from devotional Sanskrit verses called sutras, should not replace classic math practices. But, he adds, they offer students fresh, and ultimately faster, ways to calculate. A Hindu holy man, steeped deeply in Sanskrit and math scholarship, marshaled Vedic math into the modern era. Followers of Bharati Krishna Tirthaji believe he discovered 16 sutras in a long-lost appendix to the Vedas, Hinduism's most sacred religious texts. Using these verses, Tirthaji spent eight years (1911-18) reconstructing formulas that span math's various realms, from basic arithmetic to advanced calculus. Indeed, Tirthaji enthusiasts claim the 16 sutras encompass all possible mathematical knowledge. But they're left with precious little guidance from their guru. He supposedly wrote one book for each sutra and entrusted them to a disciple. Near the end of his life, however, the works mysteriously disappeared. Tirthaji obliged frantic devotees and rewrote the works from memory into one compressed volume, published posthumously in 1965 under the title Vedic Mathematics. Average readers will find the book virtually impenetrable. The sutras, simple phrases loaded with meaning, like "All from nine and last from 10," and "By one more than the one before," are spelled out but hardly illuminated. And the resulting math procedures are recorded but left largely unexplained, notes Astunkar. But, for most Indians, the appeal of Vedic math has less to do with its spiritual and cultural roots and more to do with the intense competition facing students on college entrance exams, says Atul Gupta, author of The Power of Vedic Maths. Gupta's book skims over the underlying sutras, instead featuring more than 1,000 practice problems with detailed explanations of the math techniques themselves. In a workshop Gupta offered in November, all but one of the students were preparing for technical examinations in the spring. Still, Gupta waxes poetically about the spiritual nature of Vedic math. "The simplicity and the brilliance of the techniques will make you feel humble," he says. Of course, Vedic math is not without controversy. Many scholars say it's neither "Vedic" nor "mathematics." Joining 15 math and Sanskrit scholars, Madhav Deshpande, a Sanskrit professor at the University of Michigan, argued as much in a signed letter sent to India's national council on school curriculum. Advocates hope to add Vedic math to the national curriculum, which these critics characterize as arithmetic "tricks." "I believe as a Sanskrit scholar that whatever its intrinsic merits or lack thereof, the contents of 'Vedic Mathematics' have no historical connection with the Vedas," says Deshpande. Regardless what Sanskrit scholars make of the Vedic connection, it is full steam ahead for Astunkar, Gupta and other Vedic math teachers who hope to spread the practice. The goal is not to get students mired in Sanskrit, but to get them excited about math, says Astunkar. Recalling a student who found a way to expand a method for squaring numbers that end in 5 (see sidebar), Astunkar notes, "With Vedic math, their hidden creativity just pops up." Thanks to Vedic math, Chicago-based writer John Myers can instantly convert any price in rupees to dollars, astounding both chaiwallas and fellow travelers throughout India. We have just completed the first iteration of developing a computer based system, called VMaC, short for the Vedic Mathematical Core, which performs all of it's computations based on the Vedic system. It uses a set of five times tables for digits five and under, and then the various Vedic techniques thereafter. At present we are focusing on multiplication, with the initial goal of developing the software to perform all techniques up to 150 x 150. The software will include a pattern recognition module which will select the various techniques based on the input values. The VMaC system is being developed in Perl, the open source scripting language favoured by a lot of web based applications. We will shortly initiate a project web site which will allow others to participate in this development. The front end is being developed using our Acorn asynchronous animation system, which has been developed using Flash MX2004. We are aiming to publish our initial demonstration of this software in April. Eine Einfuehrung in die Vedische Mathematik. Bequemer Rechnen fuer jedermann von 8 Jahren an. Author: Willem Meijles, 2004. Publisher: Agni Vedic Books , Donaustraat 154 NL-8226 LC LELYSTAD, Tel. : 00 31 320 24 44 73 . HAVE YOU EVER USE VEDIC MATHS IN HYPOTHESIS STUDY? I am in the field of Manufacturing of Automobile Parts.Basically I am Mechanical Engg and Master in Management science.am working one organization where we started Six Sigma practices to solve the unsolved problem. As you most of the aware of Six Sigma methodology i.e. last tool of problem solving in Manufacturing, transactional, services, software process. In this process there where 5 phases of methodology i.e. called DMAIC (Define, Measure, Analyze, Improve, and Control). Analyze phase includes lot of Hypothesis study and conclusion to sort your process data through hypo statistics. So now I am providing some information those who may be not aware of hypothesis. Please refer Hypothesis information at right side of the article. So I am interested in if some one uses such type of statistics through the Vedic Maths to make the study faster and more simplify like another Vedic Maths? As you know India was invented Vedic Maths for most critical construction like Taj Mahal and so many forts etc, in which they regularly used Maths to solve unsolved problems. Expecting early response from Vedic Maths Community for improving better in Vedic Maths. RSA Information Security Conference celebrates "Vedic Mathematics"
One of the most important information security conferences is hosted by the information security company RSA. World's leading infosec researchers attend this conference and present papers. This year the conference has picked as its theme "Vedic Mathematics"
…are available at Vedic Books, http://www.vedicbooks.net/. Vedic Books also sells books on a wide range of other Vedic subjects. Dr Jeremy Pickles, who made important contributions to Vedic Mathematics died recently. He gave lectures on Vedic Maths with Andrew Nicholas and Kenneth Williams in the 1980s in London, was co-author of the book "Introductory Lectures on Vedic Mathematics" (now out of print) and was responsible for an important article published by the IMA in 1982. Jeremy was a most valued colleague and an excellent teacher whose style was both friendly and erudite.